I. Designated Lien-Chiang County Affairs Counseling Committee. A strict "Battle Field Administration" was imposed on Matsu by the Taiwan government in 1956. BFA means a kind of unique administration "based on military law, and encompassing all political affairs," which was a necessary procedure leading from war time administration to peaceful times. Thus, the BFA in essence consisted in the military overseeing all affairs under martial law, including politics and economics. Although the "county government" is a self-governed unit defined in the R.O.C. Constitution, according to "Structure of Matsu Battle Field Administration Committee," Lien-Chiang County government was not self-governed. The Battle Field Administration Committee instead ruled with supporting executive administrations, and the county magistrate had to be one of the high-ranking political campaign officers stationed in Matsu. Under such tight military control, the suffrage of Matsu people was unjustly suppressed. Besides, all governmental works were subordinate to the military's concerns and interests, and the Matsu Defense Command was an aggregated body of the military, party and local administration, the commander of which was the unquestioned leader of all these three. As for the local representation, the County Affairs Counseling Committee, which was designed to"listen to all the opinions"on paper, was established according to "Guidelines for Experimental Battle Field Administration in Quemoy and Matsu" in June, 1957. The members of the committee, however, were designated by the county government rather than elected by the people. Initially, the county government selected a total of 8 members in proportion to the population of each township, and in 1961 the committee expanded to 21 members. In 1985 the total number was adjusted again to 19 and the modified act stated that in order to be qualified for selection, a member had to be a chairperson of an association, speaker of a township council, enthusiastic about participating in local public affairs or assisting in administration, and interestingly, "modest in personality and courteous in words." The appointment and dismissal of these members were in the authority of the Lien Chiang County government. The members were obliged to serve a 4-year term without pay. The committee would convene every 6 months under the chairperson -- who inevitably would be the magistrate himself -- to discuss a limited set of issues, as was well recorded in the convention documents. Under strict military rule, it was not a functional legislative branch, and the voice of the Matsu people was nowhere to be heard. ▲ The first Lien-Chiang County Affairs Counseling Committee elected by people officially established. Social Educational center was the temporary meeting place as well as office. ▲ In January 1992, members of Lien-Chiang County Affairs Counseling Committee, led by the speaker Chen Chen-Ching, petitioned Ministry of Interior Affairs that Matsu and Quemoy have a seat in the Legislative Yuan respectively. The lifting of martial law in Matsu on Nov.7th 1992 also marked a new era for democracy in Matsu. Following the essence of democracy and the political situation of the time, Lien Chiang Temporary County Council was established by the government. The inaugural council consisted of 12 elected representatives appointed by the Fu-Kien provincial government of R.O.C. The speaker, Chen Chen-Ching, and his deputy, Liu Mei-Kuan, were previously the speaker and deputy speaker, respectively, of the County Affairs Counseling Committee. The Temporary Council was assembled at a time when Matsu was gradually moving away from being a military outpost and becoming an open society. Although it was in many respects an interim arrangement, it was nonetheless the prototype for council politics in Matsu. The value of democracy, in this otherwise conservative and closed political environment, was gradually realized by local élites. The legacy of Battle Field Administration still lingered in the local government during those 16 months as the magistrate was still appointed rather than elected. The development of Matsu and its links to the outside world came about as the result of a consensus among the élites and local government officials, who in turn gradually planned the future of the islets. Nov.7th, 1992 marked the end of the Battle Field Administration era of Matsu and Quemoy. Heralding the era of self-governance was the inception of the highest democratic representative department: the county council. 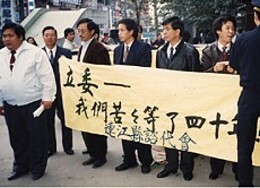 The election of the first Lien-Chiang County Council occurred in January 1994. The inaugural Council was composed of 9 councilors in accordance with "Guidance of Self-Governance realization in Quemoy and Lien-Chiang of Fu-Kien Province" and "Structure Code of Quemoy and Lien-Chiang County Councils." The councilors excelled in many aspects such as speaking for the people, demanding funds for the public, improving transportation, developing tourism, and ultimately improving the living standards of local people. Since the second term of the council, in each term there would be 9 councilors elected from 4 constituencies of this county (Nangan, Beigan, Juguang and DongYin) to monitor the administration and serve the people wholeheartedly. 1957‧Lien Chiang County Affairs Counseling Committee, which was to "listen to all the opinions," was established according to "Guidelines for Experimental Battle Field Administration in Quemoy and Matsu" by Executive Yuan of R.O.C. Eight members were selected, in proportion to the population of each township, to a 4-year term. The chairman of the committee was always the magistrate. The committee could merely make suggestions, and had no right to monitor the administration or examine budgets. 1961‧The number of committee representatives was increased to 21, and later reduced to 17. 1985‧Speakers of local township councils and the heads of the guilds of fishermen, farmers and traders, as well as the women's association, were incorporated into the committee to strengthen representation. The total number of committee members became 19. 1990‧As the outcry for democracy among locals grew, the government held the first general election for the County Affairs Counseling Committee. Twelve members were elected from 4 townships across the islets; they enjoyed the right to examine budgets, of interpellation of government officials, and to formulate legislation. The council site was temporary located in the Social and Educational Center. 1992 Nov.7th‧Battle Field Administration of Matsu and Quemoy was abolished. Matsu officially stepped into self-governance. Lien Chiang County Affairs Counseling Committee was reformed into Lien Chiang Temporary County Council and the members were appointed as councilors by Fu-kien provincial government. 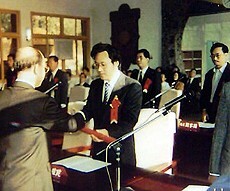 1994 March‧The inaugural Lien-Chiang County Council was assembled of 9 councilors from 4 constituencies of Nangan, Beigan, Juguang and DongYin in accordance with "Guidance of Self-Governance realization in Quemoy and Lien-Chiang of Fu-kien Province" and "Structure Code of Quemoy and Lien-Chiang County Councils." 1996 Nov 7th‧Lien-Chiang County Council Building in Fuxing village, Nangan, was completed.